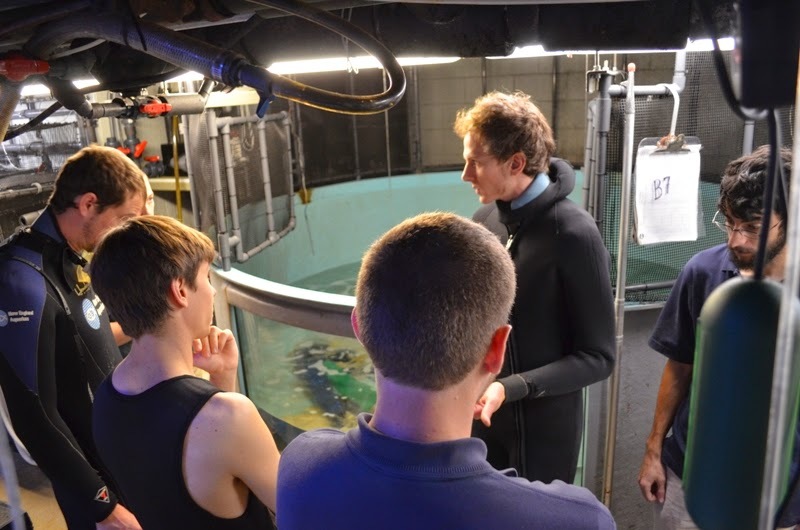 The health of our animals is something we take very seriously at the Aquarium. If an animal requires medical care, we can many times treat those injuries or illnesses while the animal remains on exhibit. Sometimes, however, this isn’t possible. In these cases, the animals are taken out of their exhibit spaces and given some TLC behind the scenes. The Blue Hole exhibit, located on the second floor, has a number of resident goliath groupers. 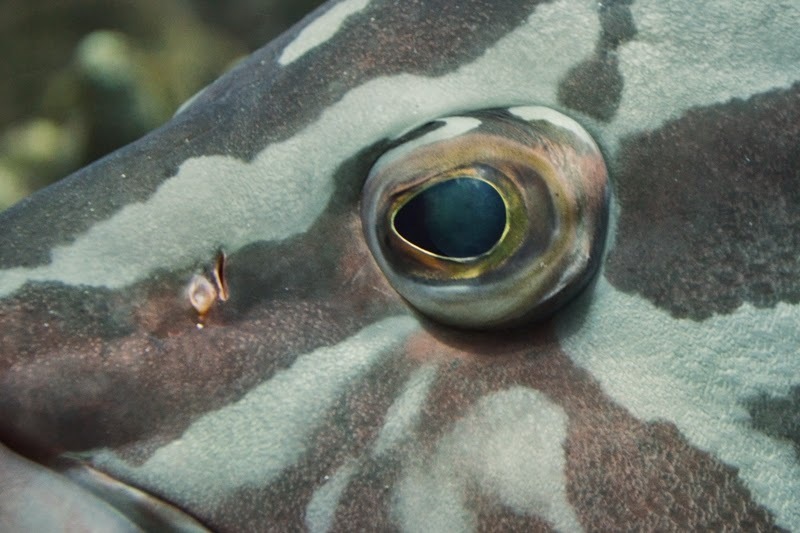 Recently, one grouper developed some health issues: it wasn’t eating normally and had some trouble regulating its buoyancy. As the Blue Hole is one of the largest gallery exhibits, it would have been very difficult to treat the animal effectively while on exhibit. 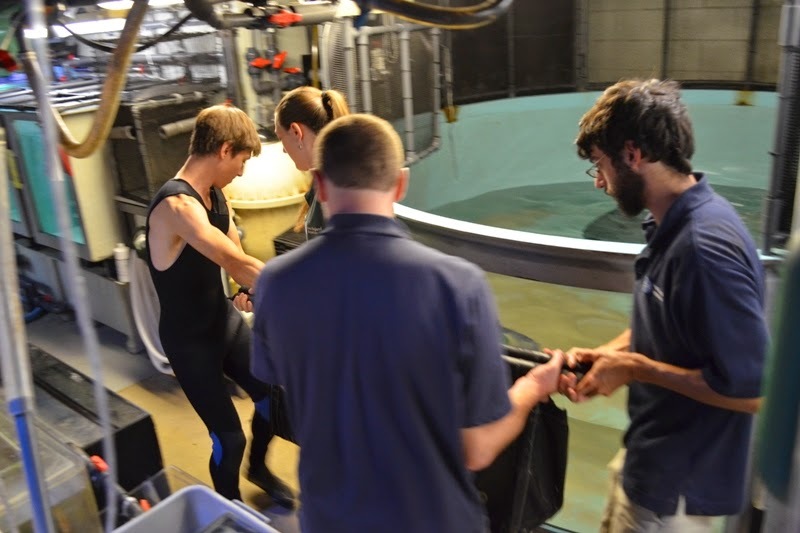 As a result, the grouper was placed in a large holding tank behind the scenes. After a couple of months of care and monitoring, the health issues cleared up and it was time for the grouper to head home! Moving a goliath grouper, even a relatively small one, is no easy task! 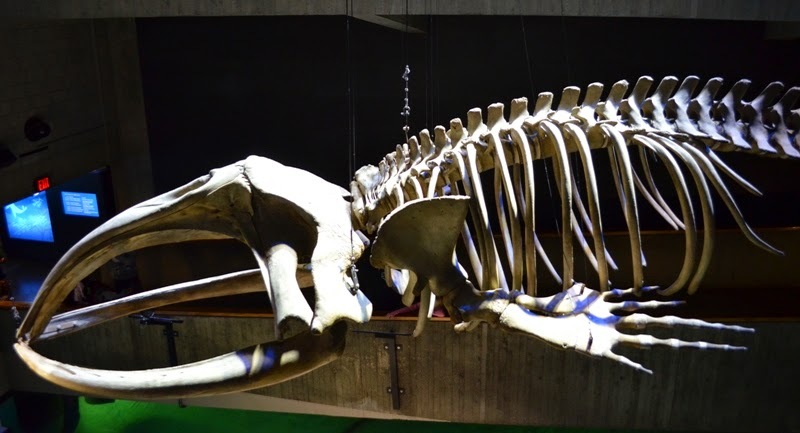 A team of staff and volunteers assembled in the morning and came up with a plan to move the fairly large fish out of holding and down the narrow hallway to its exhibit. Along the way, it would be weighed by the veterinarians to see how it had been growing. 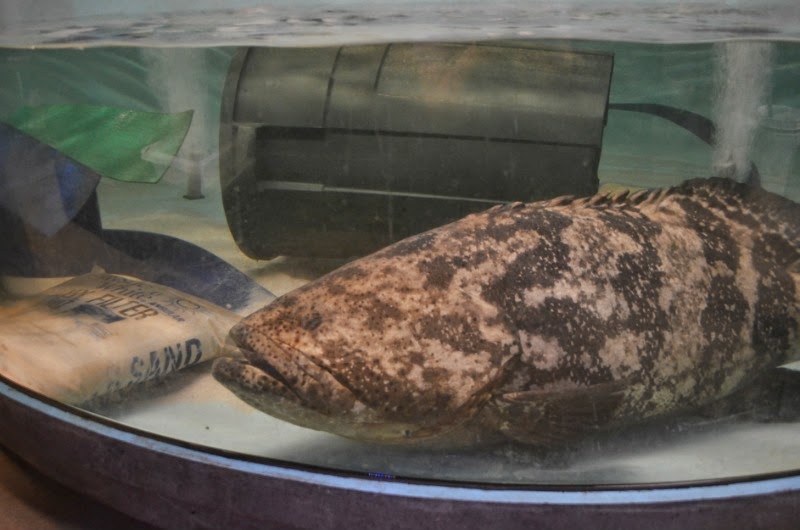 Once the plan was in place, it was time to capture the grouper in its temporary home. After just a few minutes, the staff was able to maneuver the large grouper into a long, black stretcher. This method of moving the fish was much easier than other methods! The behind the scenes work areas are very narrow, with not a lot of room to maneuver a big holding container. The stretcher was much easier for the staff...and the grouper. 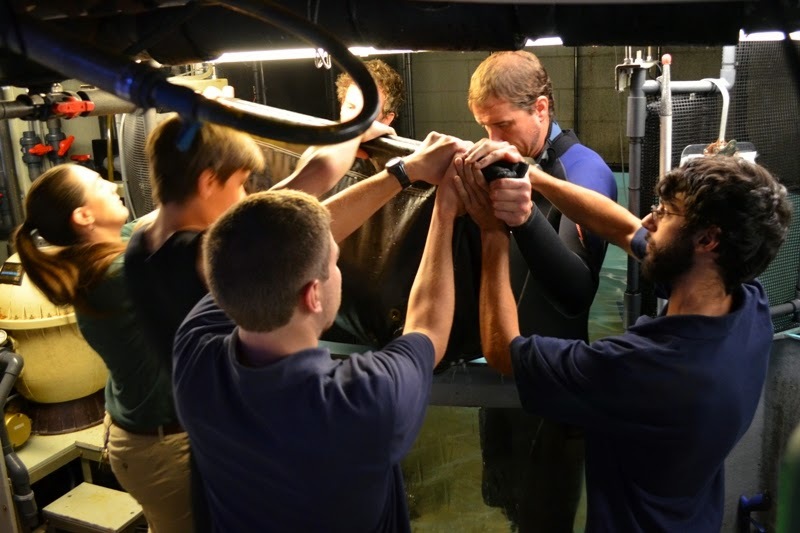 Once the animal was lifted out of the holding tank, the veterinarian staff quickly weighed the grouper. The scale showed that the grouper weighed about 70 pounds! And while that is a good sized fish, it’s a relatively small goliath grouper, which have been known to grow up to 800 pounds! 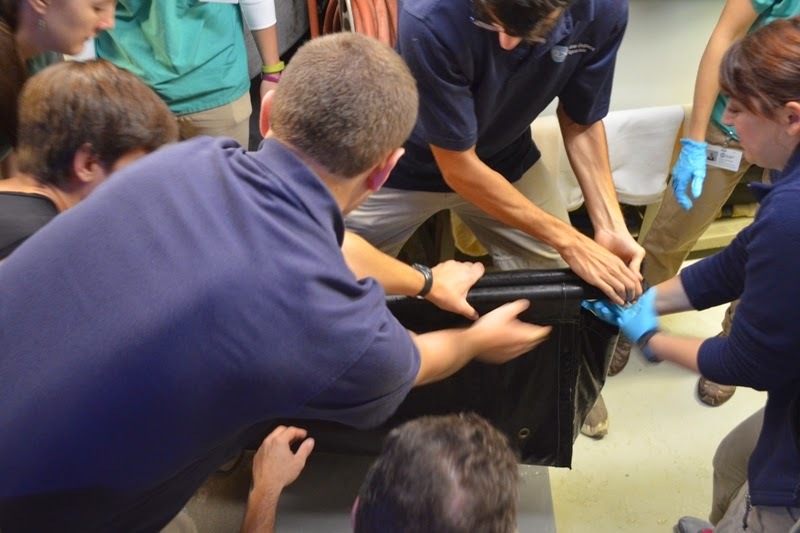 After the weigh-in, the crew moved quickly, carrying the grouper down the hall and then lifted him into the exhibit. It’s a tight fit between the ceiling and the side of the exhibit, but the staff and volunteers did a great job. Soon enough, the grouper was back home! 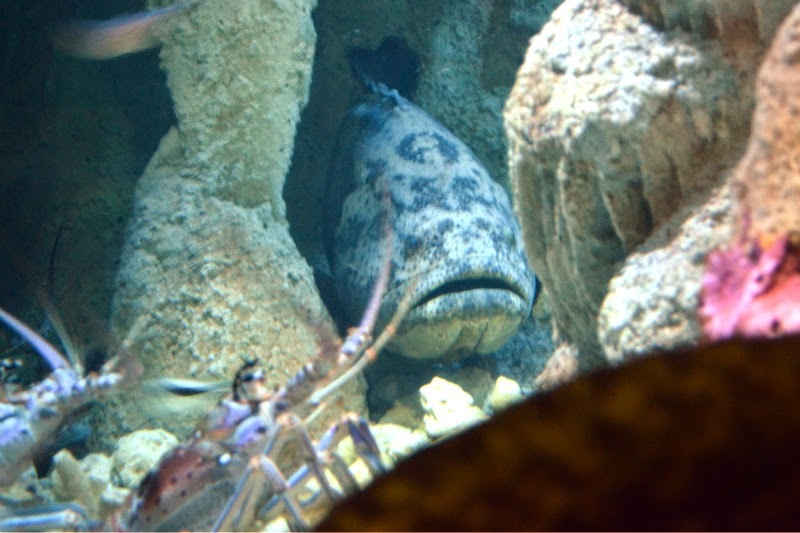 To make sure the transition went smoothly for the grouper, the staff remained in the exhibit, keeping a close eye on the fish. 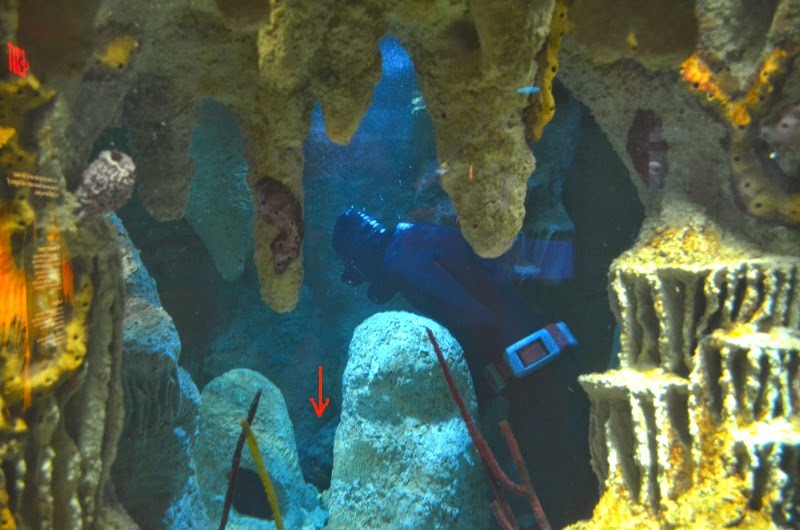 The grouper adjusted fairly quickly to its watery home, swimming to a resting spot among the blue hole stalagmites. After spending some time in this cozy location, the grouper took a spin around the exhibit before finding yet another cozy spot to rest. Once the staff was satisfied that the grouper was comfortable in the exhibit, it was time to leave and let the grouper settle in. Overall, quite a successful moving day! 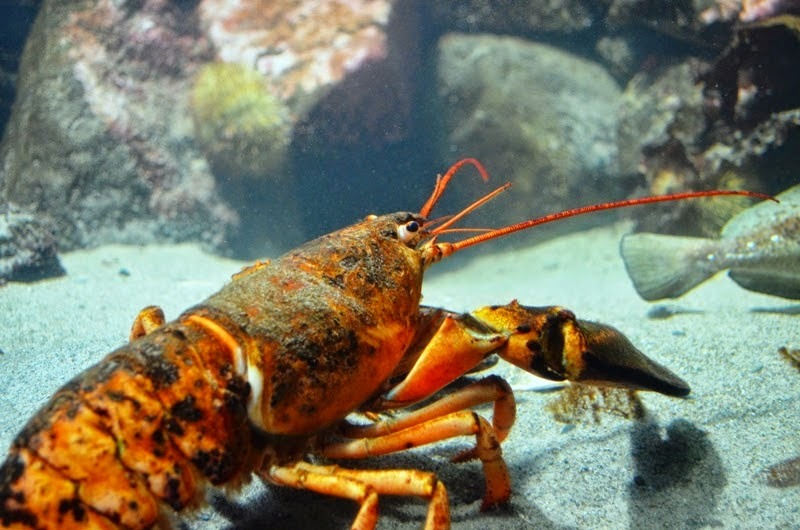 With so many exhibits, habitats, colors and patterns, not to mention animals, it's no wonder that visitors can find the New England Aquarium a bit overwhelming. However, if you slow down and take a closer look, amazing details start to pop out! It takes practice to look a little closer. Here's a quick guide to start you off. Can you tell what each animal or exhibit is by just seeing a small piece? Take a guess using the pictures below...and then look below to see if you were right! Done guessing? Think you know what each item is or belongs to? Okay...let's see if you were right! 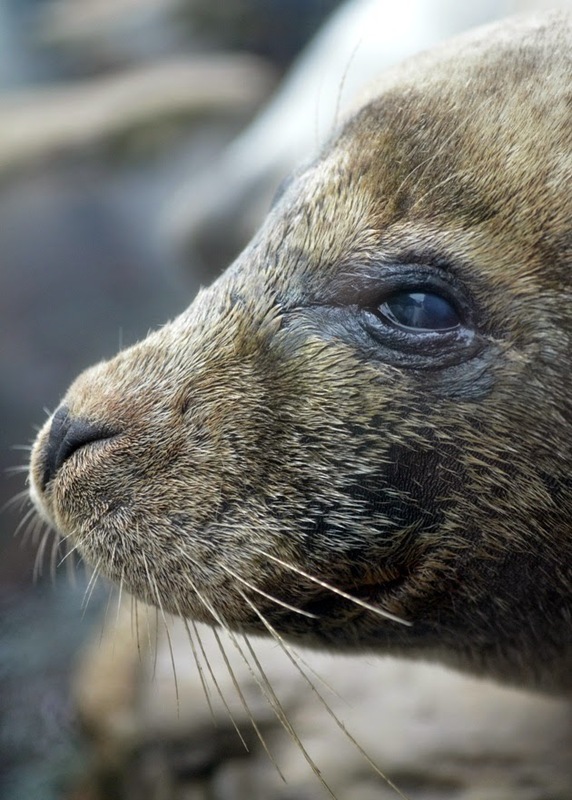 If you think that furry nose belongs to one of our marine mammals, you would be right! 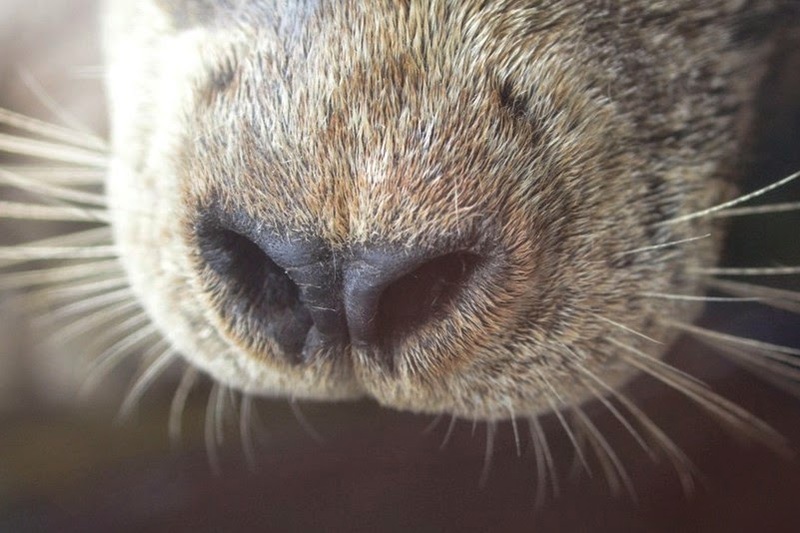 The nose above belongs to one of our harbor seals. Located in the front of the Aquarium, our harbor seals look sleek underwater. But once they have some time to dry, particularly when they are molting and growing in a new fur coat, you can see their fur clearly. 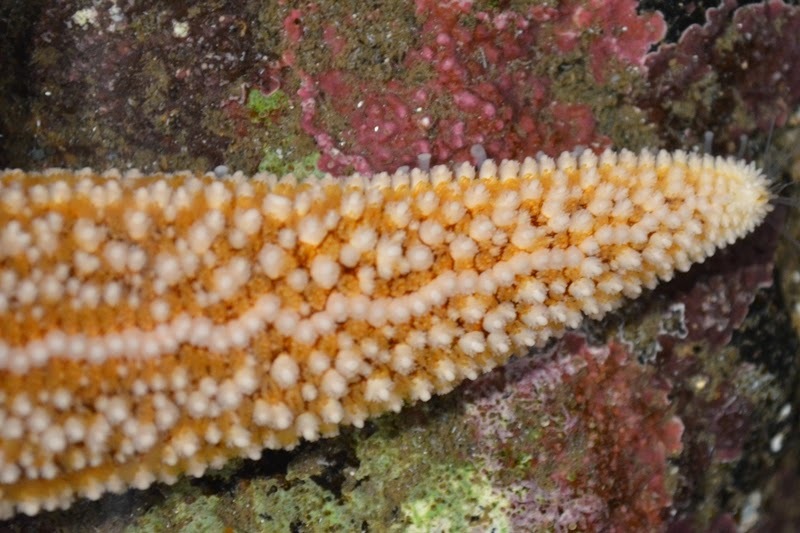 The second closeup can be found in the tide pool touch tank. That's right, a sea star! One part of the whole...four more parts to go! If you take a close look, or better yet feel the surface, of the sea star, you'll notice small, raised bumps. 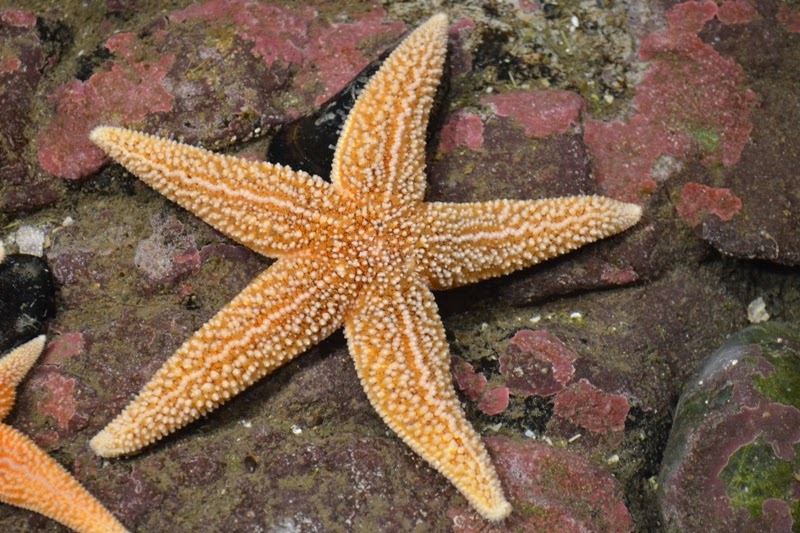 These bumps help keep the skin of the star clean, which is important as their gills are on the surface! The next set of items should look familiar-you have similar looking bones in your body, though much smaller in size. 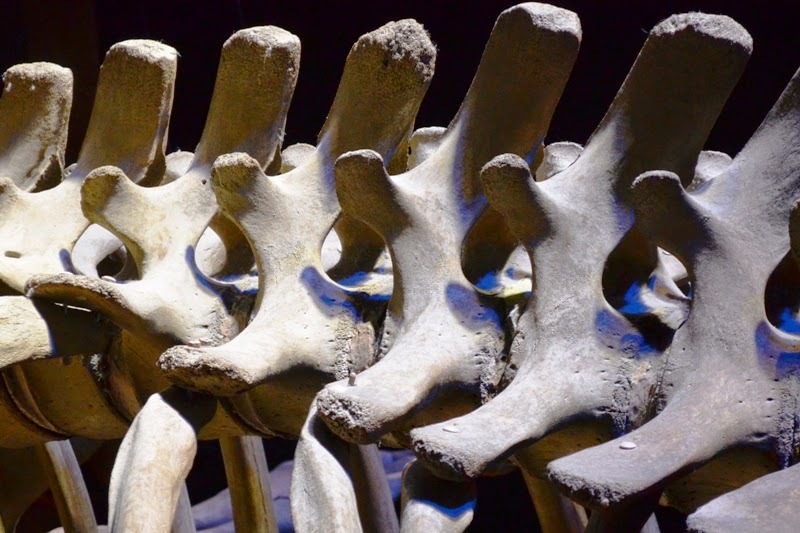 These large items are some vertebrae of the North Atlantic right whale skeleton! Okay, next one! Is it a strange, bioluminescent jelly? Sunlight off some glass panel? Nope! That glowing fin fits in on the shark wall! 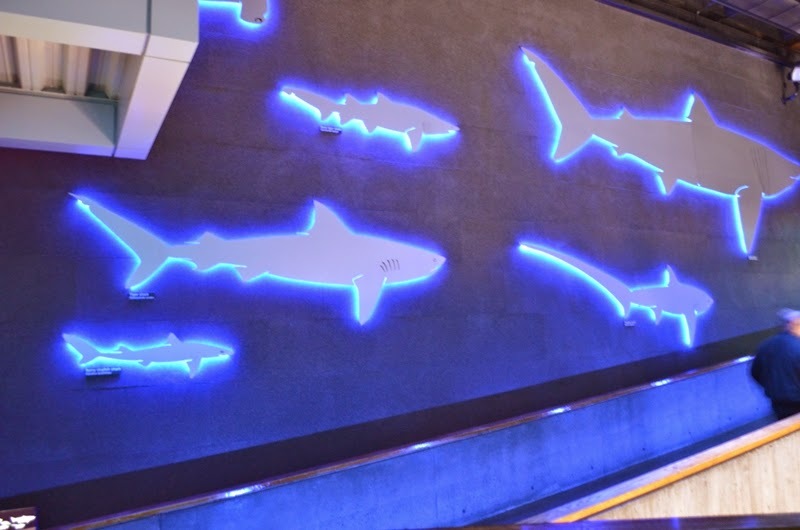 This exhibit feature showcases the silhouettes of different shark species. Many visitors don't stop to take a look, but it's definitely worth checking out! The species depicted are full size, so it's a great way to compare the size of some larger species, including basking and white sharks, with smaller species like the spiny dogfish. 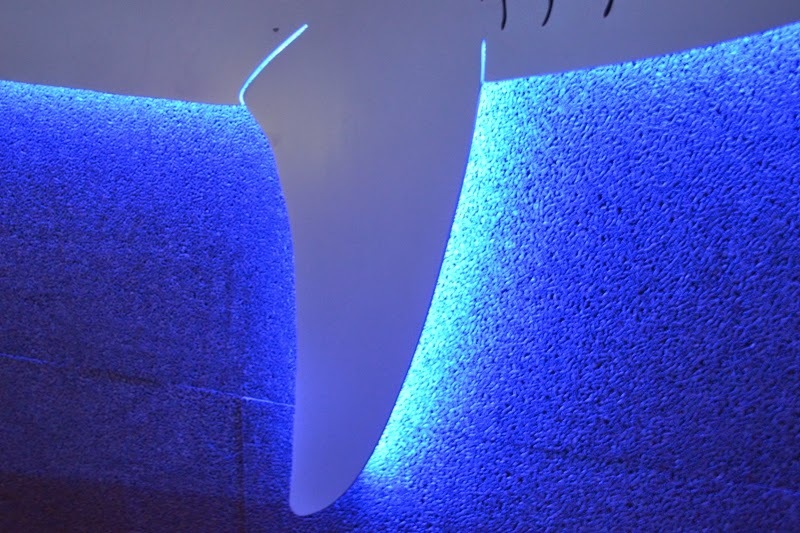 It's not just a pretty wall covering-it's a well-lit way to learn about sharks! 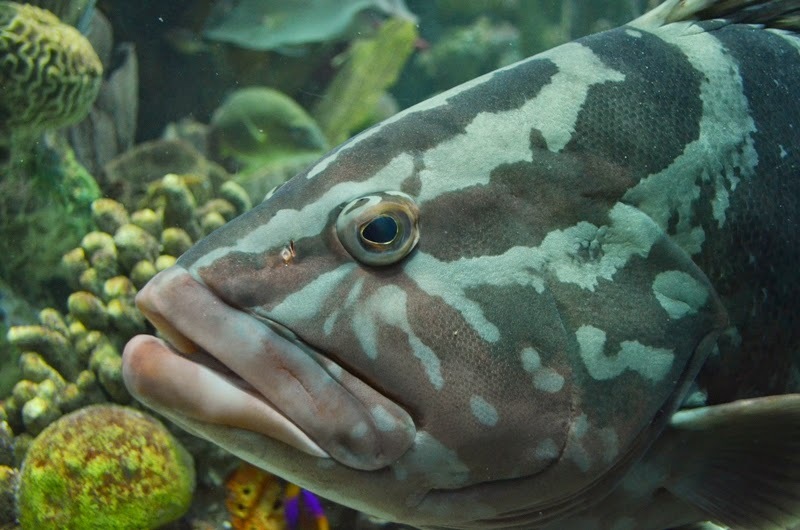 Meet the Nassau grouper, one of 120 species inside the Giant Ocean Tank! 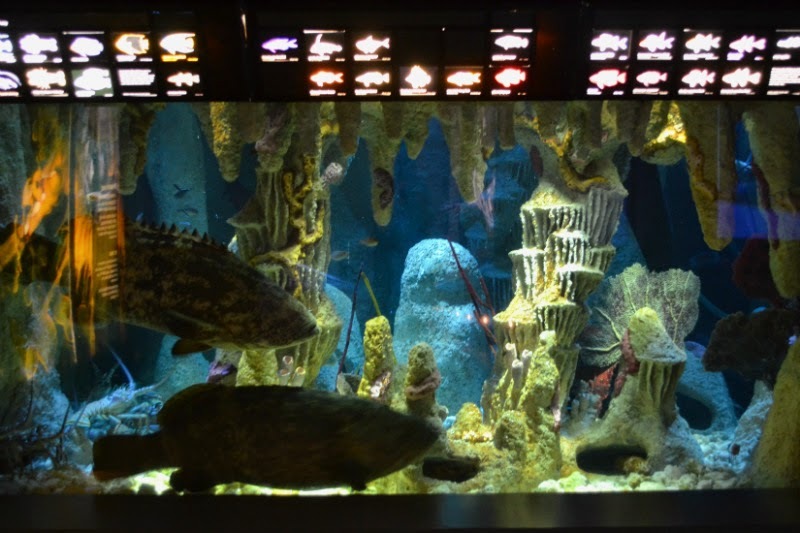 These large fish hang out towards the bottom of the exhibit, resting near sandy trays or against coral structures. You may even find these larger fish being cleaned by cleaner gobies and wrasses. Keep an "eye" out for them at the bottom of the exhibit! So next time you are feeling overwhelmed by all of the cool things the Aquarium has to offer, take a closer look! It's a great way to slow down and see some amazing animal or exhibit details you might not have seen before!